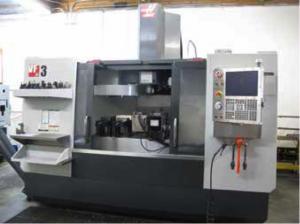 2011 HAAS VF3 CNC VMC, 5 AXIS READY, CT 40, 20 ATC, 40’’ X 20’’ X 25’’ (XYZ), CHIP AUGER, S/N 1085122. 2011 HAAS PR160Y 5TH AXIS TRUNION TABLE, 6’’ CHUCK, S/N 903986. 2011 HAAS CNC MINI MILL, CT-40, 10 ATC, 16’’ X 12’’ X 10’’ (XYZ), CHIP AUGER, S/N 1084616. 1991 MITSUBISHI DWC-90SB CNC WIRE EDM, DRO, 17.7’’ X 13.7’’ X 6.6’’ (XYZ), S/N 019SB205. BROWN AND SHARPE NO. 13 UNIVERSAL OD AND TOOL CUTTER GRINDER. 2011 GRIZZLY LATHE MODEL G99722, TABLE TOP, 150 TO 2400 RPM, S/N 2011480. GRIZZLY CNC DELUXE MINI TABLE TOP MILL, MOEL G0619. DO ALL VERTICAL BAND SAW. CAMPBELL 5HP VERTICAL AIR COMPRESSOR. TOOLING, VISES, CT TOOL HOLDERS, CUTTING TOOLS, BENCHES AND SUPPORT. CT-40 TOOL HOLDERS AND RACK.